For all those who cannot always afford a real diamond, the cubic Zirconia has come up as the next best thing. It is just as hard and solid, with the same shine and many people even claim it is better than the real thing. Though there are ways to differentiate between a diamond and a Zirconia, many actually get fooled, at the first instance, into thinking the latter to be a real diamond. However, even when it comes to cubic Zirconia, there are people who have been fooled into buying cheaper glass based imitations, mush to their chagrin and waste of money. Thus, we have come up with a few tips and guidelines, when it comes to buying a cubic Zirconia engagement ring for that special someone. Here are some things to remember when you are wondering how to buy one. Cubic zirconia has gone high tech and high end in the world of jewelry. The stone of highest quality includes those by brands like ‘Winfields’, to begin with. Premium cubic Zirconia is available with an amorphous diamond coating, which reduces the windowing and shadowing that can often give a cubic Zirconia away as a fake diamond. Also, some brands offer popular type of amorphous diamond or a hybrid stone, as it is sometimes called. For a less expensive standard cubic Zirconia, look for ‘Signity’ brand. High-quality cubic Zirconia stones are, as a matter of fact, very rare. Some vendors will shy away from using this as a description and instead call their product a synthetic diamond or simulated diamond. Currently, there are no synthetic (lab-created) white diamonds in mass production. Even the few that are being produced are quite small and priced at par with a natural mined diamond. The ones known as Asha or hybrid stones are available with a variety of retailers, for instance ‘Better Than Diamond’. The cut of the stone is another important consideration in case of Zirconia, as is the case with a natural mined diamond. Look for professional jewelers who work with natural and simulated stones, for the best cut stones. One of the largest selections of cubic Zirconia stones can be found at CZ Jewelry Online. You can choose from virtually any size, shape, and color. You will have to be very reasonable about the size of the stone that you intend to buy. If you would like people to think of your cubic Zirconia as a real diamond, think about the size and style. Thankfully, no one knows your financial situation but you (! ); however, if you tend to be financially conservative in other areas, a cubic zirconia of about five carats or less will most likely not be mistaken for a diamond. What is being said in too many words is that your lifestyle will have to match up to the Zirconia that you choose, so that it can match up to the level of a real diamond. The next thing to do is to choose a setting for the ring. Go for one that would be used for natural diamonds in traditional metals or somewhere close to it, say for instance a 14-karat white or yellow gold, or platinum. Some reputed and well-known stores use only the amorphous diamond-coated cubic Zirconia in their collection. 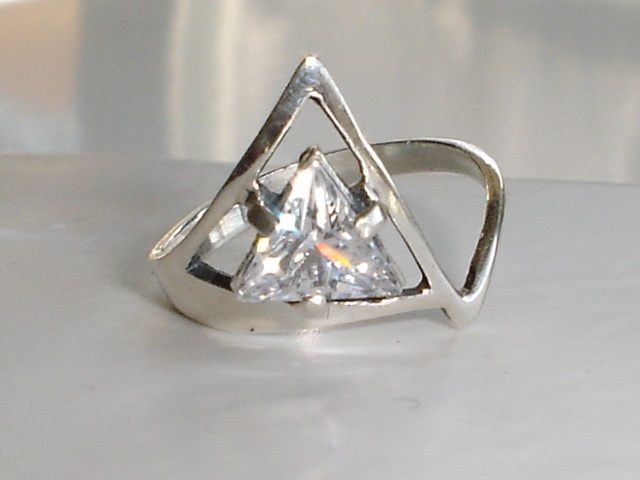 You could also design your own ring by purchasing the stone separately and then get it set by say, your trusted jeweler. However, make sure that you consult a jeweler who is experienced in working with simulated stones. Cubic Zirconia and hybrid stones will scratch easier than a diamond, so care must be taken in setting and polishing the stone, so as not to cause any damage.